Home » Coin Sets » Do You Like Ike? 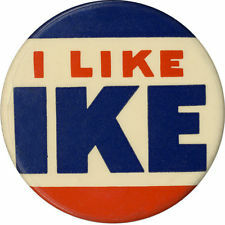 When General Dwight D. Eisenhower was running for President in the 1950’s, his popular slogan was “I Like Ike”. During World War II, Eisenhower was a 5 star General and Supreme Commander of the Allied Forces in Europe. His popularity made him run for President in 1952 and 1956, winning both times. One of the Acts passed during his presidency is well seen today, the Federal Aid Highway Act of 1956. This created the Interstate Highway System. Eisenhower noticed the German autobahns during World War II and wanted to do something similar here in the United States. As well as travelling quicker to destinations, there would be a number of straightaways so aircrafts having trouble can land on the interstate. On March 28, 1969, President Eisenhower passed away at the age of 78. That same year, there was talk about reintroducing a dollar coin to circulation. A number of legislators thought Eisenhower should be on that coin. Who wouldn’t agree more for this than Eisenhower’s Vice President, now President Richard Nixon. 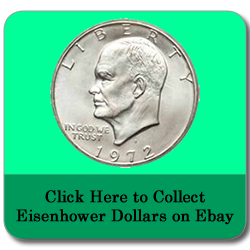 Initially, it was thought to mint them with 40% silver, just like the Kennedy Half Dollars , but by 1970, it was decided that the circulated Eisenhower Dollars would be clad (copper nickel) and collectors could get the dollars with 40% silver. 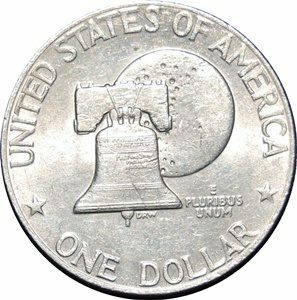 Both sides of the dollar would be designed by Frank Gasparro who honored President Eisenhower on the obverse and the Apollo 11 insignia on the reverse. The Apollo 11 landing on July 20, 1969 was the first manned landing on the Moon. Production began early in 1971, and mail orders for the 40% Silver Coins would be accepted starting in July. The silver uncirculated dollars went for 3 dollars and the silver proof dollars went for 10 dollars. The proof silver coins would be released in brown boxes and the silver uncirculated were wrapped in cellophane with a blue and silver token and placed in a blue envelope. The brown and blue Ikes as they would be known would be released from 1971 – 1974. The circulated dollars would first appear later in 1971. There were different varieties in 1971 and 1972 based on the low and high relief of the dies. By 1973, they would have a high relief die that would be used from then on. In 1975, no quarters, half dollars or dollars would be released as they would be minted as bicentennial coins and released in 1976. The reverse would have the Liberty Bell in front of the Moon. The last 40% silver uncirculated and proof coins would be released this year. There were two varieties of the lettering on the reverse. The first ones were bolder and lower relief. The second variety had sharper lettering than the first. 1977 and 1978 would show the original reverse and all coins would be clad. Though they were popular with collectors, it would be popular to many people. I remember growing up with Eisenhower Dollars . They were very big in diameter and you wouldn’t want to keep too many in your pocket. It was because of this that they would start minting the smaller Susan B. Anthony Dollars in 1979. Though they were too big for circulation, I still liked getting Ike Dollars when I was a kid. So, do you like Ike Dollars? I remember when my dad would come back from Las Vegas he would store these coins in many Jars, also give them to us for obtaining good grades in school. Back then they were not looked at something as rare or precious to have only because they came a dime a dozen. I am not a coin collector but I do love many of Eisenhower’s quotes such as “Peace and justice are two sides of the same coin”. 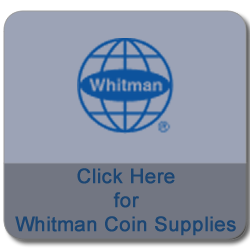 So if you want a piece of justice and a remembrance of history, purchase one of these coins from E-bay. Hey Troy! I used to get Ikes as well as Kennedys back when I was a kid. I still have them. I also collected a whole set of Eisenhowers through the years. I never heard that quote before. Good one! To answer your question, Do I like Ike dollars? I like every dollar I can get. About Ike, the man, I was in the sixth grade when the announcement came over the PA system that President Eisenhower had died. A history professor told me that Ike did not like being president and tried to spend as much time as possible on the golf course. While playing golf if he saw the press or staff members running towards him on the course, he would hide in the bushes. Thanks for this information Gary. I was only 3 when he died, but I grew up with Kennedy Half Dollars and Ike Dollars. That’s interesting about Eisenhower, the man. We don’t hear much about him today, not like Kennedy or Nixon. I would guess he was happier as a general than the President.